Here are six resources, cool tools and shiny new objects that my co-hosts, Albert Maruggi, Dave Erickson and I have shared recently on our new Blog Talk Radio Show, Beyond Social Media. We’re on every Tuesday night from 9:30 – 10 p.m. EST. 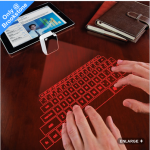 o Sold out, but way cool – Brookstone’s Laser projection keyboard lets you type on flat surfaces. You can pair it with your smartphone, laptop or tablet – and it fits on your keychain! A mere $99. Me want. o 2012’s 10 Must-have WordPress plugins that every blogger should know about. From brilliant Jeff Bullas all are intended to help you to increase Social Media sharing of your articles and blog performance. o A Man Page for Twitter This much-needed missing Twitter manual gives pretty complete instructions on how Twitter works. It was written for fun by Adam Prescott, who writes a lot of great content for serious geeks. o Jam With Chrome lets you invite four friends into a live ‘JAM’ session to play an array of instruments and collaboratively create music from a Chrome browser anywhere in the world on just about any device. It’s part of an incredibly diverse and cool series of user-submitted Chrome Experiments. o CIRIS is a robot who can make salad and clean up afterward. He added way much too much dressing if you ask me. o Instragram has created a web presence: a nice complement to the mobile app, similar to Foursquare methodology. Now, says Albert Maruggi, businesses and marketers need to examine whether to create yet another social media profile.